Menominee MI and Marinette WI are taken together here as they face each other across the Menominee River, which also forms part of the Michigan / Wisconsin state border. The land north of the river was occupied by the Ojibwe and Dakota peoples. South of the river was home to the Menominee, an Algonquin-related people. By the late 1700's, French fur traders had established small trading posts on both sides of the river. By the 1830's, the fur trade was in decline but the nascent lumber industry was poised to bring a boom to the small communities that were growing up on each side of the river. At one time, the Knapp, Stout and Co. lumbering operation was the largest lumber company in the world processing millions of board feet of lumber. As lumbering declined, the 20th century saw growth of a number of industries such as paper, auto parts and a major shipyard. The harbor remains an important shipping port on the Great Lakes. The approaches are clear from all directions. The entrance to the Menominee River lies between 2 breakwaters. There are channel markers (RED N"2" and GREEN C"1") marking the entrance to the channel. The north pierhead is marked with an Oc RED visible 7.9 NM. The south pierhead is marked with a Fl GREEN light visible 5.8 NM. A course of 245°T will bring you right into and down the channel. Approximately .25 NM up the channel, the main channel makes a dogleg to starboard. There is a smaller channel on the port side which you can follow to Harbor Town marina. If you stay in the main channel, you can follow it another 1.4 NM to Nestegg Marina which will be on your port side. To reach Nestegg Marina, you will have to pass a bascule bridge. The signal to the Bridgemaster is one Long|Short sequence on your horn. The bridge hours are 0700 to 2300 from May 1 until October 31. Coming from the south, leave Green Island to your port. The island is marked with the Green Island light (Fl WHITE visible 10.45 NM). Note that the charted shoals extend well outward from Green Island to the southeasy and are marked with a RED buoy (N"2"). Give it wide berth. To the north of Green Island, lies a charted wreck marked as dangerous, depth unknown. The "PA" notation on the chart means 'Posiition Approximate' so give it a wide berth as well. Once clear of the wreck, you can bend your course to the river entrance or continue on to Menominee Municipal Marina. Harbor Town Marina is located a short ways up the secondary south channel located on your port side as you approach the dogleg in the main channel. They have about 100 slips and keep a few open for transient sailors. There is a fuel dock (diesel and gasoline) and pumpout station. Water and power are available at the slips. This is a full-service marina capable of carrying out engine, mechanical, electrical and fibreglass repairs. There are washrooms, showers and laundry facilities. They have a well-stocked ships' store. There is access to a beach from the marina. Nestegg Marine is located approximately 1.4 NM up the river from the 'dogleg'. It will be on your port side. They have a number of slips with about a half dozen set aside for visiting sailors. There is a fuel dock (diesel and gasoline) and pumpout station. Water and power are available at the slips. This is a full-service marina capable of carrying out engine, mechanical, electrical and fibreglass repairs. There are washrooms, showers and laundry facilities. They have a well-stocked chandlery and their parts inventory exceeds 55,000 items. Nestegg Marine is located approximately 1.4 NM up the river from the 'dogleg'. It will be on your port side. They have a number of slips with about a half dozen set aside for visiting sailors. There is a fuel dock (diesel and gasoline) and pumpout station. Water and power are available at the slips. This is a full-service marina capable of carrying out engine, mechanical, electrical and fibreglass repairs. There are washrooms, showers and laundry facilities. The Waterworks Boaters' Lounge occupies the beautifully-renovated former municipal water plant. In addition to the amenities noted above, the Lounge has a chart facility, internet and e-mail access, a large acquarium and dining room. MMYC is located within the Menominee Municipal Marina. 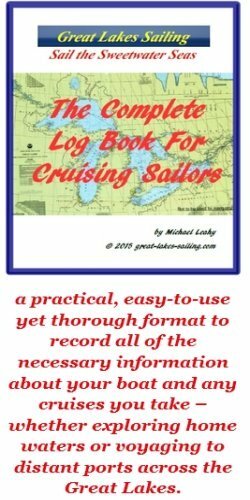 They may have some reciprocal priviledges for cruising sailors. CVS Pharmacy (906) 863-2697 is located about 1 mi/1.6 km from Menominee Municipal Marina. Valucare Center Health Mart Pharmacy (715) 732-0717 is located about .5 mi/1 km from Nestegg Marine and 1.6 mi/2.5 km from Harbor Town Marina. In Menominee MI, there are a number of restaurants and pubs along First St which runs in front of the marina. Berg's Landing is a long-standing favorite. Located in the oldest commercial brick building in Menominee, it has an extensive menu. Murray's Irish Pub and Grill is a comfortable setting to relax and enjoy traditional pub fare. You can also check out Pirates' Cove and The Serving Spoon, both nearby. The cities of Menominee MI and Marinette WI collaborate on a series of public concerts that run from June through the end of August. In Menominee, there is the Logging & Heritage Festival in mid-July. In August, visitors can enjoy the annual Waterfront Festival and the Antique Auto Show. In Marinette, Theatre on the Bay runs productions all summer. The Porterfield Country Music Festival is held annually in late June. The Menominee MI tourism site and the Marinette WI municipal information site will both give you ideas of lots more things to do and see while visiting the area.